Way back in 1985 Retrieval issued an LP (FG408) which contained the complete output of Madame Tussaud’s Dance Orchestra and, after many requests, this is now being re-issued on this cd. The original LP consisted of 18 tracks, 15 of which are included here (3 were deemed to be of too little jazz interest to use). Obviously 15 tracks would not fill a cd so we have added 5 1932/1933 Decca-recordings from Jack Hylton’s Orchestra, this also enables us to add to our “Hot Hylton”-cd (RTR 79024) which uses the best of his HMV-output. 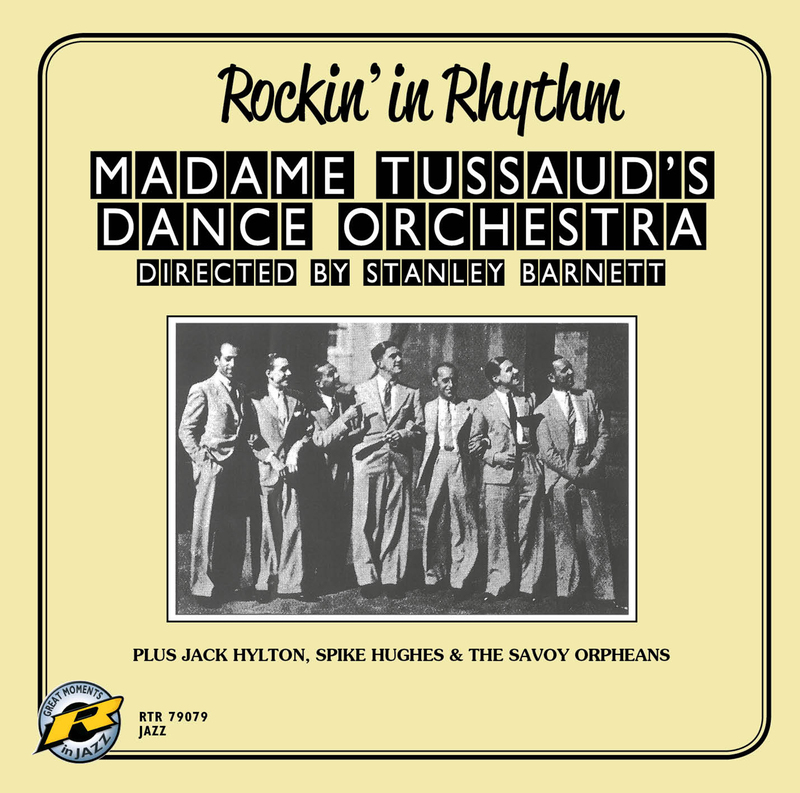 Next we have jumped back in time for the Savoy Orpheans’ 1926 version of Duke Ellington’s “Jig Walk” – the first of Duke’s compositions to be published and recorded in Europe. We have also included 2 Ellington numbers from Spike Hughes, which make an interesting comparison with the Madame Tussaud-sides in that Hughes was able to use a line-up that include some of Britain’s best known musicians such as trumpeter Norman Payne, trombonist Lew Davis and saxist Buddy Featherstonhaugh, whereas there are no big names in the Tussaud outfit, which makes the results even more surprisingly good. Sandy Forbes in his original liner notes mentions the scarcity of the gold label Edison Bell records and this is still true today. But most of the Madame Tussaud-sides were issued on various Belgian and German based cheap labels and sold in Belgium, Germany, The Netherlands, Scandinavia and elsewhere in Europe. Our title track “Rockin’ in Rhythm” is known to exist on Astra, Cameo, Imperial, Olympic, Silver Bell, Sondor, Super and Triumph and might well turn up on Disclair and Organ! These issues are not exactly common, but they are certainly easier to find than the originals. Most are anonymous. ""16 of these historical recordings are featured on the CD at hand. The ten man formation convinces with a homogenous sound...""